Rafael Nadal produced a display of incredible defiance to beat Roger Federer 7-5 3-6 7-6 (7-3) 3-6 6-2 and win hisfirst Australian Open title. The Spaniard, 22, recovered from his marathon semi-final to ruinFederer's attempt at equalling Pete Sampras's record of 14 Grand Slamtitles.Nadal saved 13 of 19 break points as he refused to yield in a stunning match.The world number one has now won six Grand Slam titles - including four at the French Open and one at Wimbledon.He took his record against Federer to 13 wins in 19matches, and five in seven Grand Slam finals between the pair, in a worthy successor to their last meeting at Wimbledon in July.Nadal won that match in five sets and, despite playing just twodays after winning the longest match in Australian Open history in hisfive-hour semi-final win over Fernando Verdasco, the top seed prevailedagain in another sensational encounter. With so much at stake it was still a surprise to see Federer, 27, makea desperately nervous start, dropping serve immediately in a woefulgame of three wild errors and a double fault.Nadal had the chance to build an early lead but was pegged backstraight away in a 10-minute game, Federer converting his third breakpoint with a smooth forehand winner down the line.The Swiss moved ahead with another break in game six when heleapt on a short serve, but Nadal stormed back in the following gamewith a magnificent running forehand and a fierce cross-court backhandbefore Federer double faulted on break point. There was plenty of the magic that the world's top two can berelied upon to produce but Federer was a little below par, serving at54% with 15 unforced errors when Nadal broke again for 6-5 beforeserving out the set.The world number two picked up his form with two spectacularforehand winners for break point in game four of the second set, butNadal chose the perfect moment to deliver his second ace of the day. A couple of vicious backhands helped Nadal to a potentiallydecisive break at 2-2 but this time it was Federer who hit straightback, levelling at 3-3 when the Spaniard went long with a forehand.Game eight of the second set was a key moment as four timesFederer earned break point, and each time Nadal responded - threefantastic serves and a drop shot saving the world number one - beforethe Swiss converted his fifth chance with a move to the net. Federer confidently wrapped up his fourth straight game to wina set during which he had served at a lowly 37%, and it had slumped to35% by the time he faced a break point at 2-3 in the third, saving itwith a forehand winner.Nadal called for the trainer after game seven and had treatmenton his right thigh, and two games later looked in desperate trouble at0-40, but the indomitable Spaniard fought his way out of trouble tostay on serve. He certainly appeared to be feeling the effects of hissemi-final, but again the world number one saved three break points inhis next service game.And an incredible turnaround looked on the cards when Nadal gotto set point in game 11 but he could not return a fine Federer serveand a crucial tie-break loomed.It was as brilliant and dramatic as expected, Nadal edging 5-3clear before earning three set points with a magnificent lungingbackhand volley, and taking the set when Federer, incredibly, doublefaulted. Nadal simply would not buckle and after Federer lost an earlybreak advantage in the fourth the set as the Spaniard fought back yetagain, the usually implacable Swiss slammed a ball into the advertisingboards in frustration.If anything, the quality of play and drama only heightened at2-2 when Nadal earned five break points of his own, winning one amazingrally with a forehand that had the crowd on their feet, but this timeit was Federer who produced with his back against the wall. The momentum had swung, for the moment, in the second seed'sfavour and he capitalised to break for 4-2 before serving outrelatively easily.It did not signal a burst of new-found confidence from thethree-time champion, however, and he was the first to crack in thedecider, playing a nervous game that included a double fault and twodesperate backhands to drop serve in game four.The errors began to flow from the Federer backhand and afocused Nadal made him pay, moving to the verge of the title with someconfident serving. Two match points arrived when Federer, on serve, hooked aregulation forehand wide but two nervous Nadal errors kept the contestalive.The Spaniard responded with a blistering cross-court backhandwinner onto the line that Federer chose not to challenge, and when theSwiss went long with a forehand a breathtaking match was finally overafter four hours 23 minutes. Serena Williams swept aside Dinara Safina 6-0 6-3to claim a fourth Australian Open crown and the 10th Grand Slam singlestitle of her career. The American second seed, 27, stormed to the first set in just22 minutes as the Russian crumbled under the pressure of her second Grand Slam final. Safina, seeded three, did break at the start of the second set but Williams broke back and soon wrapped up victory. The win in Melbourne also saw Williams become the new world number one. She collected her second trophy in Melbourne this year after she and sister Venus took the women's doubles title on Friday. Rafael Nadal will meet Roger Federer in theAustralian Open final after the world number one battled past fellowSpaniard Fernando Verdasco on Friday. Nadal won a magnificent match 6-7 (4-7) 6-4 7-6 (7-2) 6-7 (1-7) 6-4 to reach his first final in Melbourne.Verdasco's extra power looked capable of causing an upset throughout as he fired an incredible 95 winners.But Nadal made the crucial breakthrough in game 10 of the fifth set to seal a dramatic win in five hours 14 minutes. Nadal, 22, and Federer will meet on Sunday for the19th time and seventh in Grand Slam finals, with the Spaniard leading12-6 overall and 4-2 in major finals.However, it will be the first time they have played each other in Melbourne and on hard courts in a Grand Slam final. The last time they met was in the epic Wimbledon final last July that Nadal won in five sets. Verdasco, 25, may have started the second semi-final inMelbourne without a win in six previous meetings with Nadal, but he hasbeen a different player in Australia.And it was the less heralded of the two Spaniards who earned the firstbreak point in game three, dominating the ensuing rally only to wasteall his hard work by hammering a smash over the baseline. He had another half-chance at 0-30 up in game 10 but Nadal battledthrough and earned his first break points - also set points - in thefollowing game.But Verdasco displayed the same poise on big points as inprevious victories over Andy Murray and Jo-Wilfried Tsonga, saving thefirst with a huge serve and the second with an unreturnable backhand.It came down to a tie-break and, after recovering an earlymini-break, Verdasco got a huge slice of luck with a net cord at 5-4before converting his first set point with a forehand volley.The pattern of the match continued into the second set, withVerdasco's extra pace seemingly giving him the edge until Nadal steppedup a gear.The top seed earned four more break points in a titanic gameeight but Verdasco again got out of trouble with two fabulous servesand two forehand winners, before the pressure finally told in game 10.A stunning forehand winner down the line produced break pointnumber five of the set for Nadal, and Verdasco made his first majorerror by firing a forehand over the baseline.The world number one looked ready to assume total control with a breakearly in the third set, edging another gripping game with a pinpointforehand arrowed down the line.But within moments Verdasco had broken back to love with some blistering winners and the contest was well and truly back on. Nadal moved ahead again at 4-2, and again Verdacso responded immediately with a backhand winner to get back on serve.Another tie-break was required and Nadal took the initiative asVerdasco started to make errors, the top seed sealing it with a superbforehand winner followed by an ace.With the match over three-and-a-half hours old, Verdasco twicecalled for the trainer early in the fourth set and had treatment on hisleft calf.But he showed no let-up in a desperately tight set that sawneither player force a break point as they headed for a thirdtie-break, which a rejuvenated Verdasco completely dominated with moreexplosive forehand winners. The chances came thick and fast in the decider for Nadal, withfive break points going begging in the first eight games as Verdascohung on superbly with some great serving and one incredible forehandwinner.But after letting a 0-30 lead slip at 4-4, Verdasco finally cracked when serving to stay in the match.Nadal moved to three match points when his opponentdouble-faulted and, after saving two, Verdasco incrediblydouble-faulted again to end the longest men's singles match inAustralian Open history. 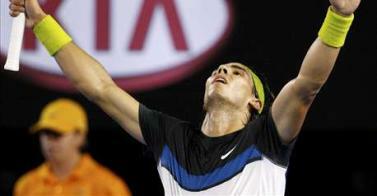 "I knew he was playing well," said Nadal. "It was very tough. "I didn't think I played so bad but he was so aggressive all thetime, served unbelievable. I don't know about the final. It's going tobe a little bit tough. "Roger is going to have a little advantage with one day's restand only three sets so he's for sure the favourite but I'm going to trymy best to recover." Roger Federer cruised through his semi finals with a straight sets victory over American Andy Roddick, Federer put on a vintage diaply hitting winners at ease, Roddick lost his temper several times in the match after the umpire claimed that roddick could not have hit a return of serve which had been challenged by federer. Serena Williams and Dinara Safina will fight forthe world number one ranking in the final of the Australian Open after wins in Melbourne on Thursday. Second seed Williams beat fourth seed Elena Dementieva 6-3 6-4 in their semi-final as the Russian's serve fell to pieces after apromising start. In the all russian clash between Safina and Zvonereva, Safina basically outlasted her opponent, and even though it was finished in straight sets the scoreboard did not justify the battle that zvonereva put into this match. World number 1 Rafael Nadal defeated frenchman Giles Simon in straight sets despite not having to show the type of form he has so far in the tournament, Nadal was rarely troubled by the passive Simon. Andy Murrays victor Fernando Verdasco overcame Jo-Wilfried Tsonga in 4 sets to cause a somewhat shock, Leaving him to face Countryman and world number 1 Nadal in the semis, maybe nadal will be a small bit relieved as he lost to Tsonga in the semis last year. In the womens side of the tournament Elena Dementieva put a holt torising star Suarez-Navarro's Campaign by breezing through 6-2,6-2. Things were not so easy for Favourite Serena Williams who had to come from a set behind to beat Russian Svetlana Kuznetsova, williams put ina fighting display and as soon as she levelled the match kuznetsova crumbled. Roger Federer put on a devastating display to thrash Del Potro in straight sets including a double bagal, this form outlines his desire to prove he is still the best in the world. Defending Champion Novak Djokovic Retired in the 3rd set of a fascinating encounter with Andy Roddick, Djokovic blamed the intense heat and lack of recovery time from his early hours win in the last round for his retirement. The Fairytale of The Australian Open for Jelena Dokic ended against the 3rd seed Dinara Safina, Safina won in 3 sets and looks likely to go all the way, Dokic has put in a good display this week and looks to rise up the rankings and put her depression behind her. Vera Zvonerava defeated Marion Bartoli from france 6-3 6-0 in a somewhat easy win, at 1 point she won 11 games in a row.